No. 40, Jalan Industri USJ 1/11, Taman Perindustrian USJ 1, 47600 Subang Jaya, Selangor, Malaysia. 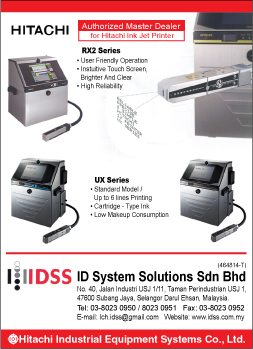 ID System Solutions Sdn Bhd, one of the leading supplier of ink jet coder in Malaysia, has ben involved in the jet coding industry since 1998 in our market. We distribute a wide range of high quality ink jet printer for packaging industrial products. These include coding, marking, labeling and printing of any type from small to large character for product identification, quality assurance and production control.